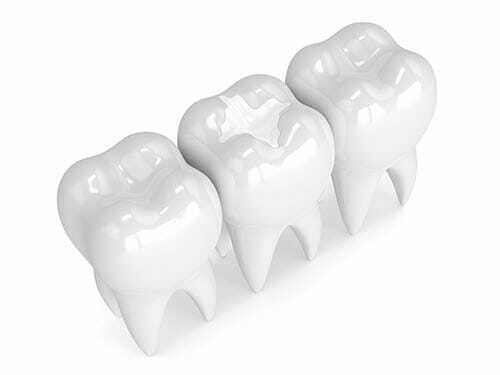 Dr. Bowen and team believes strongly that protection means prevention, and sealants are a simple way to ward off decay, cavities, and worse problems that could emerge down the road. A thin coating made of plastic is carefully painted onto the chewing surface of molars, premolars, and any deep grooves in the teeth. It’s in these grooves where over 75% of decay gets its start. Dr. Bowen will apply the sealant to seal up these grooves so the surface is smoother and easier to clean by brushing. Sealants are strong and will last for years but are not permanent. They may need to be reapplied if they chip or become worn. Dr. Bowen and the dental hygienist will examine your teeth to determine if sealants are a smart choice for you. Children and teens, up to age 16, benefit from sealants once their six-year molars come through since these years see a higher frequency in cavities. Adults with deep grooves that are not yet decayed also benefit from the proactive prevention sealants provide. Sometimes baby teeth need sealants if they have deep depressions and/or if they are prone to getting cavities. The teeth being sealed will be cleaned and cotton will be placed around them to keep them dry. A solution is applied which bonds the sealant to the teeth. You’ll rinse out the solution and the teeth will be dried, then the sealant will be applied to the teeth which will harden on its own or cured with a light. It only takes minutes and the results last a long time. We’re known for outstanding results.